Our First Road Trip...With Kids! One Baby. One Toddler. One Very Full Car. Eight Stops. 2,289 Kilometers. I didn't want to spend money on airfare. I really, really wanted to go on vacation. I LOVE vacation. And I felt like I needed one really badly after four months of balancing a new baby, a busy freelance business, and a very active toddler. So...I convinced my husband that a road trip would be a great idea. We'd get to see some family (we're stopping in Ottawa to see my in-laws), we'd get to see extended family (we're stopping in the Laurentians to visit my husband's relatives at their country home), we'd get to see some friends (we're stopping in Montreal to visit friends who just had a baby), we'd get to see the mountains (we're stopping in Vermont), we'd get to see the ocean (we're going to Maine), we'd get to explore something totally new (we're going to the Catskills in upstate New York), and we'd get to do some shopping (we plan to make a stop at the Waterloo outlets near Syracuse, NY) with a stopover in Syracuse to sleep. No drive would be more than four hours—hence all the stops. And, we'd get to spend some quality time as a family. Perhaps I was dreaming. One four-month-old. One three-and-a-half-year-old. One SUV packed full of luggage and strollers and beach toys and diapers. An iPad loaded with shows, and movies, and apps that will hopefully keep my toddler entertained. Lots of kids music sourced from the great advice of my friends on Facebook. Bags of healthy snacks from Bulk Barn. A suitcase full of colouring books, stickers, dolls, and toys to keep my toddler entertained once we've cut her off from using the iPad. A hardcover copy of Sisterland by Curtis Sittenfeld (which I really hope I get time to read). And a big bottle of Advil (plus plans to buy a nice bottle of wine at each destination). I know it won't be relaxing. I'm sure there will be moments of chaos. We might second-guess our decision a few times. But, I'm hoping it will be lots of fun! Our soundtrack for the trip: Ziggy Marley's Family Time album—for when we want everyone awake and excited about hitting the road! What am I forgetting? What can I do to keep my kids (and myself) happy and sane along the way? Please share your family road trip tips, tricks, and advice in the comments section below—the best ones will be published in my next post. It Seems As Though EVERYTHING Is Bad For You These Days! Navigating The World of "Natural" And "Healthy"
I'm feeling a bit overwhelmed. No matter where I turn or what I read, it seems I'm faced with something else that's bad for me or for my kids. There's sunscreen filled with nasty chemicals, and the sun's harmful rays. There's the danger caused by using the microwave and the health risks of texting too much. There's GMOs and parabens and BPAs and toxins in your clothing! And now video monitors are bad for baby's brains. I've been on a personal quest to rid my home and life of some of these nasty chemicals and unhealthy habits, but sometimes it feels like every time I take a step forward, I'm finding myself two steps back. It started with household cleaning products. I switched to more natural alternatives for sprays, cleaners, dish soap, and laundry detergent right before Willow was born. Then I swept through all the makeup, cosmetics, and toiletries in our home. Swapping soaps and lotions with 'cleaner' less chemical-filled varieties, for me and the kids. I've tried many different brands along the way. And, while I'm still a bit confused about what's actually "good for you" and what is harmful—I think I've come a long way. Or so I hope! Though many people have questioned this decision saying, "We were raised washing our hair with Johnson & Johnson and we turned out fine...," reports such as this one— "Johnson & Johnson to Remove Formaldehyde From Products"—found in the New York Times last year, made me even more confident in my decision. Now I'm faced with the much more overwhelming challenge of changing the way we eat. This has always been a struggle for me, and it's become even more difficult since having kids. I desperately want to eat well and to make good food choices for my kids. But, I have years of not-so-great habits that I'm trying to undo, a husband who also needs convincing, and a 3-year-old who has already grown quite fond of ice cream and other treats. I love bread. I adore cheese. And, I crave ice cream. The more I read, the more I find problems with the foods we're eating. And, the more I hear about people ditching gluten altogether, removing sugar from their diets, and substituting dairy with other "milks" like almond and soy. 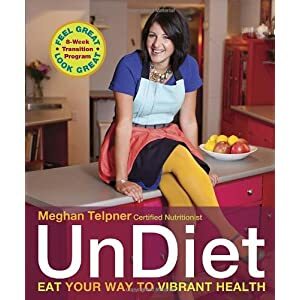 I stared reading a very well-written and extremely informative book by Toronto nutritionist, Meghan Telpner called UnDiet: Eat Your Way To Vibrant Health. If you're at all into food and wellness you've likely heard of it. I'm only half way through and I've already done a full sweep of my home, eliminating many of the unhealthy foods that were causing clutter in my pantry. But I worry that I have such a long way to go. I'm also bothered by the fact that even the healthy foods are being made unhealthy with chemical sprays, genetic modification, and processing. I know I can't trust what the labels say. And, I know that "Healthwashing" is a real thing—and a huge problem for many shoppers. I believe, as Telpner says, that eating foods as close to their natural form as possible is the best way to eat. I love shopping at the farmer's market. I've been trying to buy organic as much as possible. I'm doing my best to avoid processed foods. But, these days, stepping into the grocery store is stressing me out. And, then there's the whole issue with stress. Did you know that stress is actually super unhealthy? Oy! When did life get so complicated? Being responsible for the well-being of two little people is starting to make my head spin. I guess I've got to start making choices. What really matters? How can I make the best of the information I have, without going crazy? What changes should I make now, and which ones can wait? I'm still trying to sort this out. Any suggestions? How do you cope with all the bad news about things that are bad for you?